Washing/rinsing meat and poultry prior to cooking is not necessary and may promote cross-contamination to other foods. If you choose to rinse raw poultry, be sure to wash sink and tap areas well with hot soapy water and disinfect with a bleach solution. Place the turkey with breast side up in roasting pan. Lightly brush with oil or melted margarine and sprinkle outside and cavity with seasonings. Add ½ cup (125 ml) water or clear soup stock to bottom of pan. Insert meat thermometer into thigh being careful not to touch the bone. Place pan on barbeque grill preheated to medium and close lid. After 20 – 30 minutes, lower heat to medium-low and tent turkey with foil to prevent over-browning. Baste every 15 – 20 minutes. For barbeques with temperature settings, keep barbeque adjusted to 350°F – 375°F (177° C – 190°C). Add more water/stock to pan if it dries out during cooking. 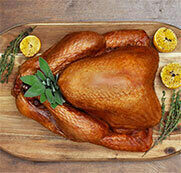 Cooking a turkey using the rotisserie in your barbeque is easy and results in a delicious meal. Note that cooking times will vary depending on individual barbeques. To ensure the best results, use a meat thermometer to check for doneness. Insert the meat thermometer in the deepest part of the inner thigh, but not touching the bone. Turkey is cooked when the meat thermometer reads 170°F (77°C) for an unstuffed turkey.